We provide Visa Facilitation Services for most countries… India, China, Australia, New Zealand, Russia, South East Asian countries, Middle East , most African countries, Canada, Central and South America. In some embassies, Ramesh Travel cannot represent you. For the European countries visa, the applicant has to go personally to the embassy and apply. You can still approach us for initial guidance and we shall be happy to oblige. For the USA (America), UK (United Kingdom Visa) we facilitate the initial online processing of these visas, and offer guidance for proper application essentials. 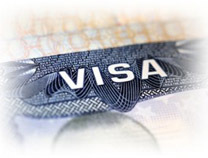 We also specialize in the facilitation of visas for countries which DO NOT have their embassies in Singapore. To name a few = Algeria, Benin, Botswana, Croatia, Cuba, Ecuador, Guatemala, Iran, Kenya, Mozambique, Namibia, Rwanda, Sudan, Syria, Tanzania, Uruguay, and Yemen. C) Communicate with the embassy there on your behalf. D) Get you the appointment date for the visa. E) Arrange our agent there in Jakarta to fetch you from the airport, get you directly to the embassy, get you to the local bank for the payment of the fees, and eventually drop you back to the airport ... all within the same day !